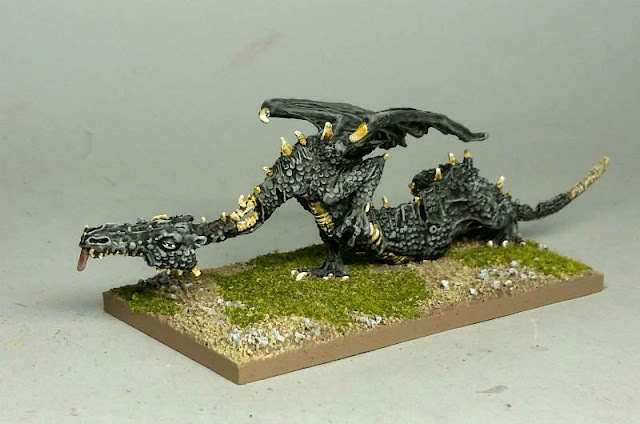 I painted up the Undead Dragon in similar colors to the rest of the Undead(ish.) I've got mixed feelings about the results. I think I may end up putting a little more (brush)work into it. I'm trying to find a balance between wanting to add detail, but keeping the simple character and palette of the rest of the Undead. Maybe I should hold off and put that effort into one or two of the living dragons first, and then take another look and see how I feel about this one? He/she needs a name. For the moment I'm referring to him/her as "Calgon the Black" until I think of something more appropriate. Man - that is THE BOSS. A beautiful miniature and a really exquisite paint job. I also really like the way you have not overdone the base or cluttered it up with too many details; the way it is really keeps the eye on Calgon. Isn't Calgon a cleaning product or a mouthwash or something? Yes, Calgon is (was?) was a brand of both bath bubbles and laundry detergent. 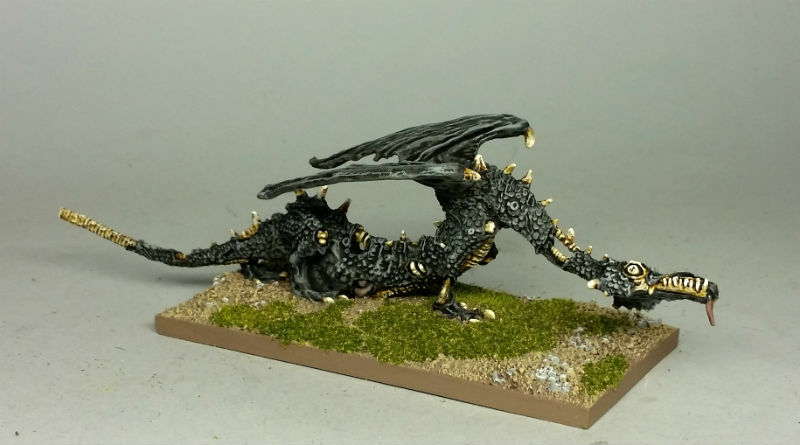 It's an (admittedly weak) play on "Ancalagon the Black" -- the biggest, baddest dragon mentioned in Tolkien's writing. Calgon, the bath soap, had a slogan, "Calgon take me away!" I thought at some point this could be an (admittedly weak) excuse for a kidnapping/hostage scenario involving the dragon at some point. Fair enough. The essence of Oldhammer is painful, herniating puns. Calgon it is. Undead Armies last longer with Calgon! Lovely work and inspired name choice!